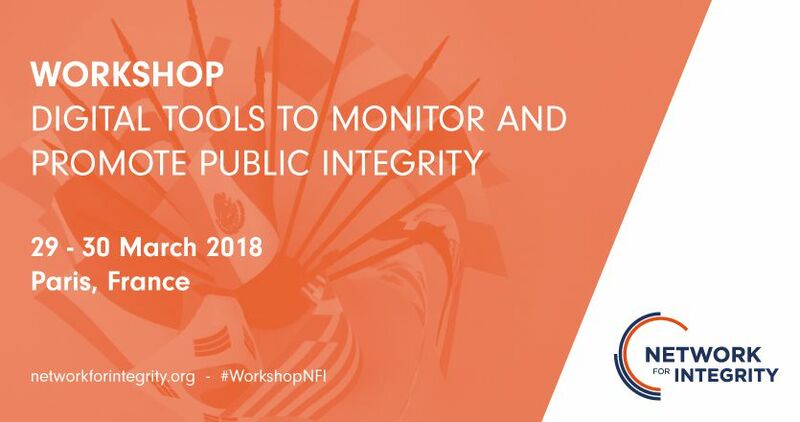 The Network for Integrity organized a workshop on digital tools to promote and monitor public integrity on 29 and 30 march 2018, in Paris with the support of the Organization for Economic Cooperation and Development (OECD) on the occasion of the 2018 Integrity Week. This workshop brought together some fifteen institutions and experts from international organizations (Council of Europe, OECD) to share concrete experiences in the development and use of digital tools to collect, monitor and/or publish data pertaining to integrity in the public sector. Presentations underlined that e-filing systems allow to enhance the quality of collected data and improve compliance with declarative obligations. On this occasion, members of the Network discussed the 2018 action plan and reasserted their commitment to keep exchanging and improving their procedures and instruments in order to strengthen integrity, ethics and transparency in public life. They also emphasized their willingness to take part in rebuilding trust of citizens in the public decision making processes and in their public officials. The Network for Integrity created in December 2016, brought together 14 national public institutions in charge of fighting corruption and breaches of ethics.